Is this traffic school certified by the Washington, D.C. Department of Motor Vehicles? Yes, this online defensive driving course, also known as a Driver Improvement Course or traffic school, is DMV-approved. Successful completion meets the traffic school requirement for having points removed from your license after a driving infraction in Washington, D.C. once you have your DMV Hearing Examiner's approval. How do I know if I should take the course? If you have received points on your license due to a driving infraction, you must take an approved defensive driving course to have them removed. 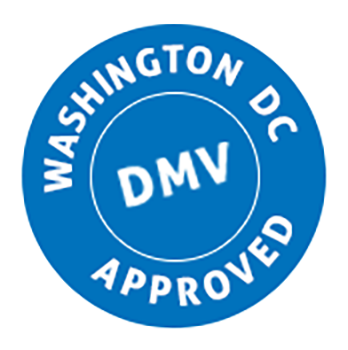 However, before you enroll in the course, you need approval from a D.C. DMV Hearing Examiner. Once you are approved, you will have 15 days from the date of the hearing to pay the ticket violation, and you will have 30 days from the date of the hearing to complete the course. You may also take the course voluntarily without points on your license, and doing so could qualify you for a rate reduction in your auto insurance. Check with your provider to find out your options. It also works as a great refresher on the rules of the road and driving safely for anyone. Yes. Any personal information you provide is transmitted using industry standard 128-bit SSL encryption. This is the same level of encryption used for online banking as well as online commerce across the globe. To verify the site is using strong encryption, when you press "Register" you will notice in the address bar that the URL starts with https. That tells the browser to use a secure standard for online transactions. Also, other notifications are often available to provide assurance like the padlock symbol in IE and Chrome, or the green bar in Firefox and Chrome. The Defensive Driver traffic school course takes a minimum of 8 hours to successfully complete. Expect to spend at least this amount of time completing the course. No, unlike the classroom setting where you may have to take the course in one sitting, the benefits of taking this online traffic school are that once you have registered, you can log in and out of the course as many times as you wish, 24 hours a day, 7 days a week. When you log out, our system remembers where you were and when you log back in it will return you to the same point. This online format allows you to create the schedule you want with the only restriction being that you must successfully complete the course within 30 days from the date of your DMV Hearing Examiner's approval. Do I still have to pay the fine if I complete the course before the fine is due? Yes. The online traffic school can get your points removed, but it does not take the place of the fine. Be sure to pay your fine within 15 calendar days of your DMV Hearing Examiner's approval for online traffic school. What do I have to do to show the DMV I've completed the course? Nothing! Once you've successfully completed traffic school, we'll electronically submit your certificate to the DMV. The DMV will then notify you they have received the certificate and that your points have been removed. Online traffic school lets you skip the trip to the DMV! You will be able to download a copy of your certificate at no additional cost for your own records. We offer our online traffic school for the low price of $29.95, but we also offer a Lowest Price Guarantee. We promise you the lowest price on your defensive driving course. If you have any questions, give us a call at any time at 1-800-393-1063.